I don’t think it is any secret that I don’t exactly handle stress well. Anxiety simply isn’t a fun time even if you don’t have any anxiety disorders or anything. It’s something we’ve all experienced at least once or twice. 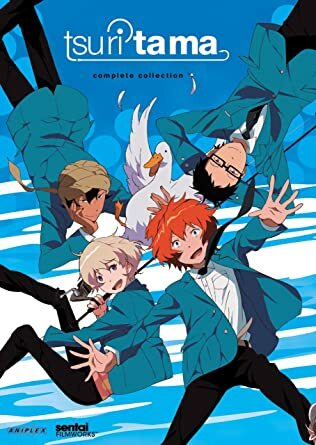 Not too long ago I accidentally purchased an anime titled Tsuritama which is about a group of high school boys who fish together. It’s also about aliens and saving the world but, that’s anime for you. What really stuck out for me though was how they portrayed the main character’s anxiety in the early episodes. The main character of the series, Yuki, is one who overthinks and worries about what others think of him. He’s bounced around from place-to-place at the start of the series and wants to be sure to nail his introduction at his new school in the sleepy seaside town located on the island of Enoshima. Of course, he has a lot of anxiety about messing up and is a bit socially awkward to boot. As he attempts to introduce himself the room begins to fill with water until it is as if Yuki is drowning. He struggles and does his best but unfortunately ends up making an ugly face before failing to properly introduce himself like he had wanted. Later, he reflects on the events of the day at home as a sort of recap for the audience where we see how Yuki has interpreted the events so far. Yuki warps things to be a lot more negative than they were, such as a compliment toward him becomes a dig at his character. This portray of a socially awkward kid with anxiety issues is just so spot on. It is easy to resonate with if you are like me and are more-or-less this person. Even if you aren’t, there’s no doubt that you’ll be able to appreciate the portrayal because, as I’ve mentioned, anxiety is something we’ve all experienced at least a few times in our lives. Fortunately there is hope for Yuki. An alien named Haru moves in with Yuki and his grandmother. Haru ropes Yuki into a fishing adventure with the fate of the whole world on the line. Meanwhile, a secret organization who hunts aliens, Duck, is investigating strange events on the island of Enoshima. As for the show itself, Tsuritama will teach you a fair bit about fishing and why it is important to have a strong social support network. While the scenario is a bit wacky, there is a character who is a talking duck named Tapioca if that gives you any idea, the message is taken seriously. This anime is far from perfect but I’m really glad that I ended up purchasing it, even if it was by accident. I was pleasantly surprised and I’m sure you will be too. A-1 Pictures really did a good job with this 2012 production that has its own unique visual flare. Aspects are reminiscent of Birdy the Mighty: Decode but only when it came to aliens. As the show progresses, Yuki is continually saved from drowning in his anxiety, and thus becoming frozen in his decision making, by his friends who push him forward. Eventually, even his self-reflection back flash segments become more positive. Seeing Yuki progress as a character with his friends was a meaningful experience and something that I have to respect despite some issues I had with the series overall. At its core, Tsuritama is a, “power of friendship” anime but it offers a take that just isn’t seen in a lot of anime: Having a support network can really make a world of difference (literally)! Have you seen Tsuritama? What were your thoughts on it and what other shows have you seen portray anxiety or other similar disorders well? Let me know in the comments below. If you enjoy the work I do here please consider sending a few bucks my way by clicking the button below. As always, thanks for reading and I hope to see you back here at Jon Spencer Reviews again soon! This series didn’t sound like my cup of tea, as I am not into fishing, but I gave it a chance after reading MIB’s positive review. In the end I liked it quite a bit. Some people can thrive under pressure, but I am not one of those folks. In many ways I can relate to the main character. Back in school I hated the times you had to speak in front of the class. My face would go bright red. Sometimes it is good to break out and try something different. I think a lot of people can identify with the main character so that’s why I recommend it even if the anime isn’t the strongest. This was a decent show. I reviewed the UK release a while back and it is one of those shows that requires binge watching to truly understand and appreciate it! I agree, the show was pretty good but nowhere near perfect. That said, this particular angle it just nailed so well I felt like I had to talk about it some. This sounds really interesting. It sounds like something I could relate to. I could definitely relate to this. Anxiety is a pain to deal with especially during job interviews and such. I will struggle with anxiety as well and Tsuritama sounds like something I would love! I actually love weird and wacky stories they tend to be more entertaining and unique. 🙂 I will check it out! Thanks for the tip!